If you are not in the City limits and would like to fill out a petition to be annexed, Click Here. 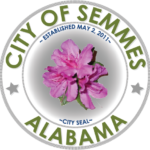 Your completed annexation application must be remitted to the City Clerk at City Hall, 7875 Moffett Road #F, Semmes, Alabama 36575. Until the property is contiguous with current City limits. the property will be listed as “pending” status. If contiguous, the City Clerk and GIS Coordinator will present potential annexation to City Council who will vote to approve or deny the annexation petition. Search Annexations in our City Ordinances Portal, select a year below to get started.